FusionPBX installs several default dialplans. 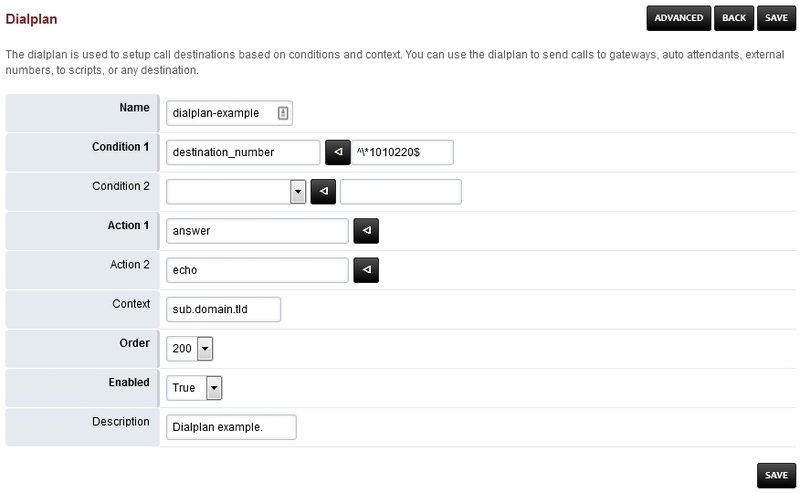 FusionPBX also gives the option to make new dialplans. This gives you the power for more advanced functions, and produce the desired result. You can create a new dialplan or copy and modify an existing dialplan. Click the Plus icon at the top right. Complete required fields and click save. Find the dialplan you want to edit and click the edit icon. Once you enter data into the empty fields at the bottom and click save, more blank fileds will populate if needed. 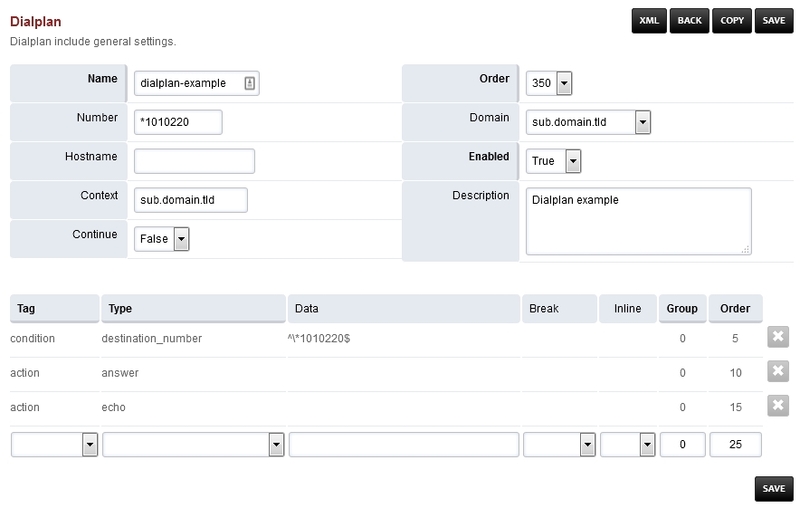 Dialplans that have a value in the Number filed can be enabled and used in Dialplan > Destinations. Setting the destination field to True will enable the dialplan to be visable and used as an action in Dialplan > Destinations. This example will be for calling an extension on another tenant. This can be done several ways. We can use the adding a dialplan example and modify it for this example. This would require a prefix of 5 followed by 4 digit extensions. The prefix can be any number that you choose to use and the 4 digit extension must match the destination tenant. So if the destination extensions are 3 digit then you would use 3 instead of 4. Finally we have the desired dialplan to call from tenant A to tenant B. 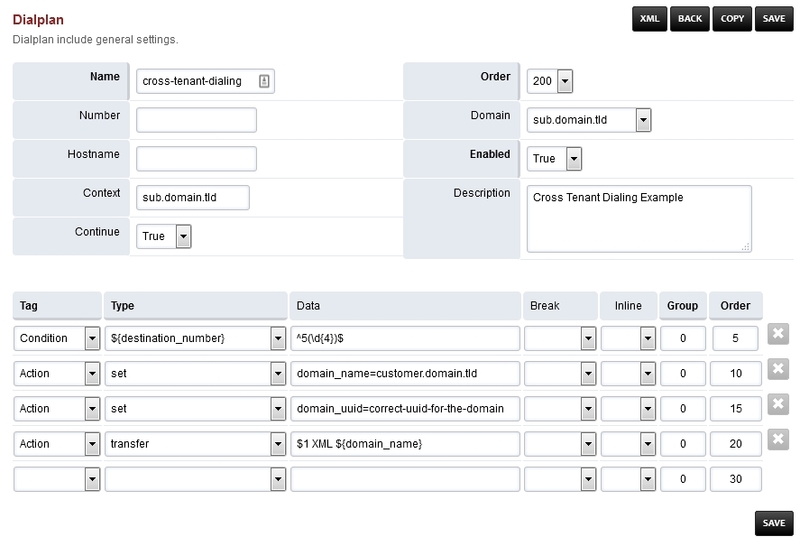 A quick way to find a domains uuid is by going to Advanced > Domains. Then click the edit icon on the domain you want to know the uuid of. The uuid will be at the end of the url.